No matter how great the City of Sails is, there’s always the impulse to hop in the car and head out of Auckland on a road trip…it’s part of our DNA. Whether you want to unwind in nature, have an adventure or soak in the sights on a ferry before stopping for something to eat and drink, we have it all at our fingertips. Here are eight epic day trips from Auckland for you to tick off one by one. Head 50km north of Auckland to historic and beautiful Puhoi. Here, you can hire a kayak and take a gentle ride down the river. If shopping is more your thing, there are a couple of speciality stores to explore. The Slow Water Trading Post sells Native American treasures or, head to the sports club grounds on the last Sunday morning of the month for fresh produce, coffee, breads, cakes, olive oil and so much more. There’s also plenty of craft items for sale, including jewellery, soaps, knitting and beauty products. Shopping done, head to the iconic Puhoi Pub and Hotel for an experience like no other. With a sprawling lawn and plenty of outdoor seating, step inside to see the walls covered in unexpected treasures—fun signage, bills from all over the world and old bottles. Here, the staff are funny and friendly as they serve up all day breakfast or the Kiwi classic fish ‘n’ chips, mussel fritters, steak or opt for one of their next-level burgers (including a vegetarian option). There’s also plenty of toasted sandwiches, pizzas or even a platter to choose from. You won’t go hungry here. Wash it all down with a golden ale. No day trip from Auckland to Puhoi is complete without a trip to the Puhoi Valley Cafe and Cheese Shop. Here you’ll find the unique tastes and textures they’re famous for. It’s worth staying for a bite to eat here, too. With a solid brunch menu, as well as some delicious platters, sit inside the cafe or head out to sit on the grass by the small lake. A little further up the road, head to the Matakana Farmers' Market and shop up a storm. At these markets, you can find unique, one-of-a-kind handmade treasures, as well as iconic Kiwi eats like whitebait and paua fritters. Fill your shopping bag with artisan cheese, homemade bread, fresh produce, deli treats, and sugary nibbles and head to the beach for a gourmet picnic. Matakana Village is an eight-minute drive from one of the most popular beaches in the region, Omaha. The white sand beach has clear blue water, and a dolphin visitor every now and then, making it the perfect spot to snack on your market offerings and watch the waves for some friendly guests. 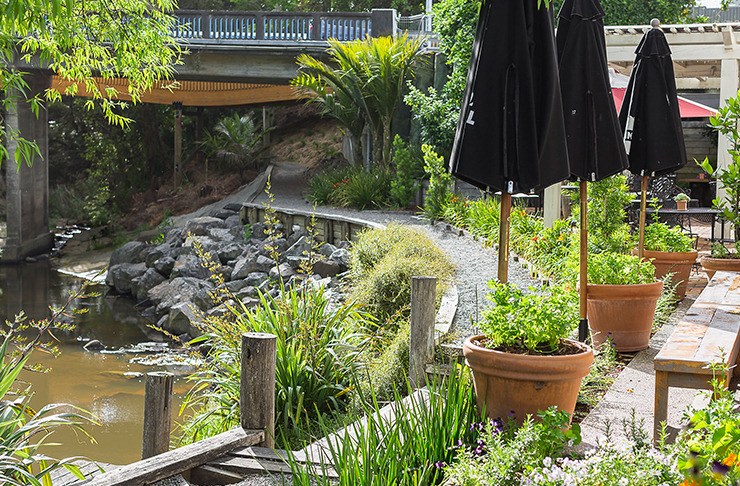 Head back into town and you’ll find a collection of Matakana shops open all year round. Browse for hours through the beauty and tonic stores, home and design shops, and art galleries unique to Matakana. Spend the rest of the day wandering Sculptureum, the New Zealand famous gallery and gardens with colourful creative artwork from all parts of the globe. The outdoor art gardens are second to none and the winery next door is an added bonus. A trip to Matakana is never complete without a real fruit ice-cream. End the day with a pit stop at Tramcar Diner, right in the centre of town, for your fresh strawberry-cone fix. Stalagmites or stalactite? Bring back those memories from high school science classes and drive two-and-a-half hours south of Auckland to the Waitomo Caves. These spectacular caves with glow rooms will have you oo-ing and ah-ing in amazement. The vast Ruakuri Cave is naturally decorated with limestone formations, waterfalls, and glow worms. 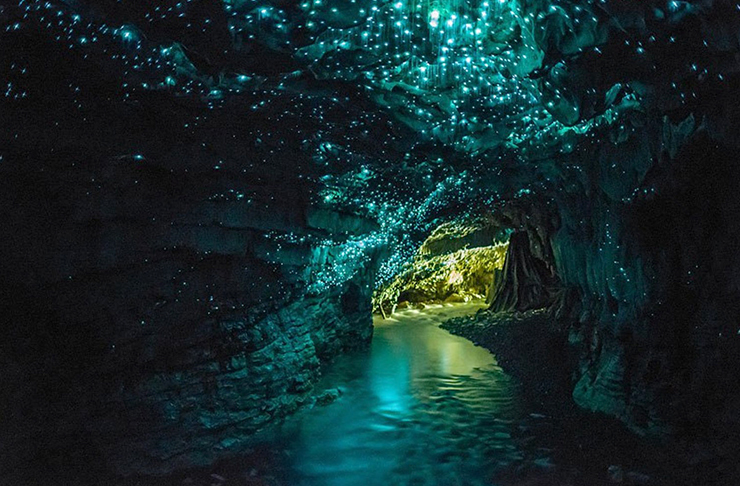 The Waitomo Glow Worm Tour takes you on a boat through the cave, under the luminescent ceilings. It’s a tick off the bucket list, seeing the galaxy of glow worms in their natural habitat. If you prefer something a little more adventurous, Waitomo Caves is full of experiences. Take your pick between black water rafting, and abseiling inside the caves themselves. All this adventuring is sure to build up your appetite, so hit up Huhu Cafe for some of the best eats in town. The sleek interior overlooks the Waitomo Village, with a cosy wood fire in winter, or an open-air deck in summer. Choose from a set dining menu, or graze to your liking from the standard lunch menu. Each dish has a wine to match, as well as Huhu’s collection of boutique New Zealand beers and ciders to choose from. After lunch, take a relaxing stroll around any one of Waitomo’s scenic walks. The options are endless. From the Waitomo Walkway outlining the famous limestone formations, to the Waikawau Tunnel with white cliffs and the only route to access the beautiful Waikawau Beach. Another market to hit (and closer to home) is the Oratia markets each Saturday morning. Here you'll find delicious fresh, local produce including pies, pastries, cheeses, seasonal fruits, oysters, breads, meats, and organic locally roasted coffee. Brunch is sorted, and you’ll be able to stock up the pantry for the week ahead. Once done, make sure you go back on the main road and visit Just Plane Interesting, which is filled with second-hand goods that are, yes, just plain interesting. You’ll find weird and wonderful treasures from retro decor to old army uniforms. There’s even a dark mysterious room, home to a mummy if you’re brave enough. 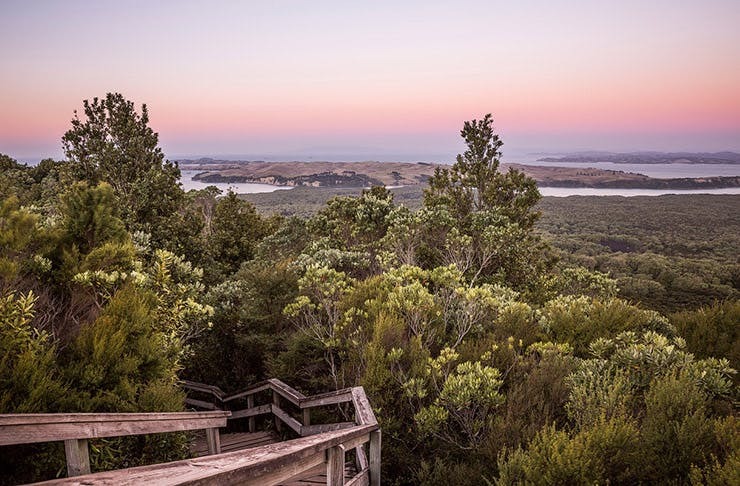 After your visit, stretch those legs with a hike through the Waitakere Ranges. The hills run along Piha, Muriwai, Te Henga, and Karekare filled with hidden natural gems along the way. Tackle one of the harder hikes, or take things a bit slower and beach hop the black sand coast. End the day with a bite to eat at one of Piha’s legendary eateries, or take a short drive up to Riverhead and claim a table at The Riverhead tavern for stunning sunset views. The Landing Restaurant is the venue’s restaurant, with tables on the deck above the stretching river. The menu is comprised of fresh, seasonal dishes. Everything is made from scratch at the down-to-earth gastropub. Choose from one of the Riverhead’s famed dishes such as the Riv’ Ribs coated in smokey BBQ sauce, or the slow-cooked lamb shoulder to share. If you simply can’t choose, opt for Tastes of The Riverhead and try the chef’s five-course daily specials. 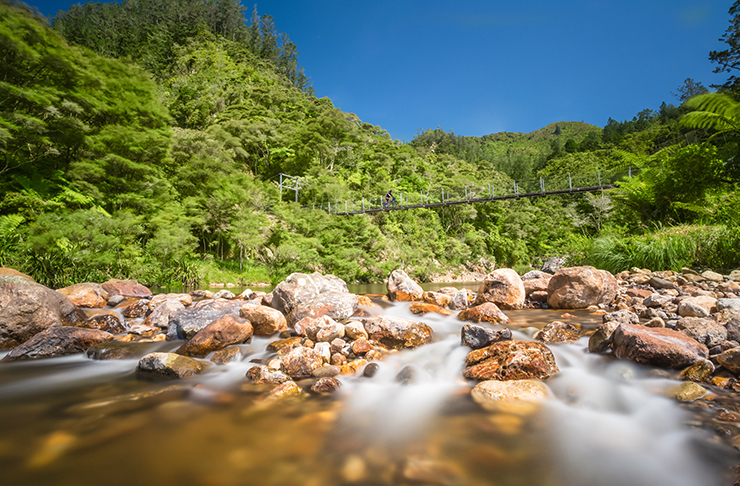 A slice of magic just two hours south of Auckland, Karangahake Gorge is filled with cliff faces with sheer drops, native bush, gushing waterfalls and the mighty Ohinemuri River. The gorge has multiple bush walks, each with a different unique aspect. The Windows Walk trail leads you through the gold-mining trail dating back to the 1880s, including remains of the old Talisman Battery Plant. Or, venture deep down into the Karangahake Tunnels which take you along the old underground railway track used for mining back in the days. Pro tip: take a torch. Cool off after your walk with a dip in Owharoa Falls, a stunning staircase waterfall in the gorge. The scenic spot is accessible from the road. After learning some gold mining history and discovering all the secret spots in the gorge, make a beeline to Bistro at The Falls Retreat for a bite to eat. The Falls is a retreat from busy city living, with a relaxed and elegant setting. The menu changes seasonally, with ingredients coming straight out of The Fall’s very own veggie garden, as well as eggs fresh from their chickens. Their flavour-packed wood-fired pizza is famous in the region, with flavours such as BBQ chicken, pickled jalapenos and sundried tomatoes, or daily catch, shrimp, smoked salmon with a parsley and caper gremolata. The entire menu is diverse with a dish to suit every palate and picky-eater. Technically still in Auckland (it’s the most eastern town), Maraetai has a stunning beach to soak in the rays and have a splash in the water. The beach stretches six kilometres along the Pohutakawa Coast, so you’ll be sure to find a space along the golden sand. The water is crisp and clear, with the perfect set-up for wharf jumping at the west end of the beach. After a sunbath and dip, you’re faced with the dilemma of where to eat. Maraetai is spoiled for choice. Cross the road and take your pick from the local cafes or a fish and chip offering if you’re heading back into the water. Otherwise, take a short drive up the road to Beachlands where you’ll find the Beachlands shops. Home to The Franklin from the owners of the beloved Marina Cantina and Grangers, The Franklin is a modern taphouse and kitchen pub. They do small plates, sharing platters, pub classics, and burgers n’ dogs. As well as wood-fired pizzas Friday to Sunday. The menu is never-ending, with an extensive drinks menu to complement. After filling your belly, take the scenic back-roads to Clevedon. The Clevedon Village Farmers' Markets brings in visitors from near and far. The market has everything from fresh fish and poultry to German pretzels and pastries. With more 60 stalls, you can spend hours filling your bag with fresh produce to take home and graze on for days. It is open on Sundays from 8.30am to 1pm. 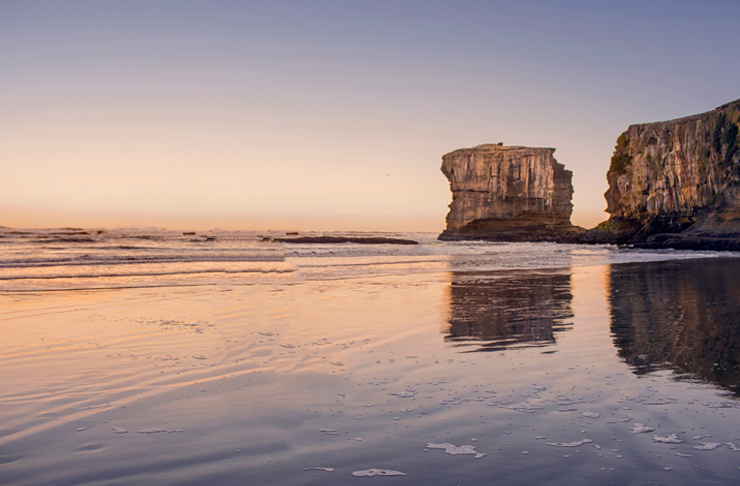 Brave the wild winds and oceans and head West to Muriwai for a fun day out. The towering cliffs pump adrenaline through your body as you walk along the coastline. The famous Gannet Colony walk resides at Muriwai, with hundreds of the white, black, and orange birds nesting there between August and March each year. They’ll be hard to miss. Marvel at the masses in their natural habitat before claiming a spot at the black sand beach. Catch some waves at the surf beach, or bake under the sun—just remember to stay protected under the hot New Zealand ozone. The sweeping black sand beach also has a little estuary to dip your toes in if the ocean is too wild and there are caves to explore, too. If you want another way to see the entire stretch, take a trek along the beach on horseback. Muriwai is known for its horse-riding trips. Sun on your face, wind in your hair, it’ll offer a whole new perspective of the West Coast. 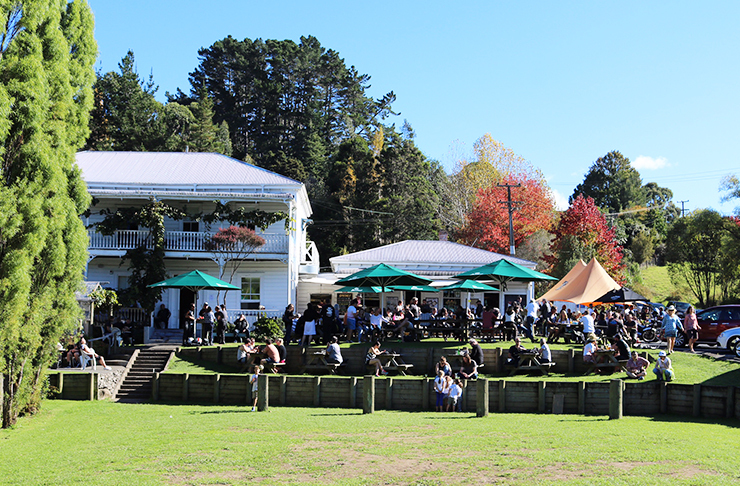 Once you’ve built up an appetite, take a short trip to Kumeu and drop by the Tasting Shed. The tranquil wooden dining area is the perfect spot to sip a glass of wine and relax off the beaten track. The food is simple and shared tapas style so are able to taste everything from the fresh market fish to the duck liver parfait, with a Baileys, chocolate, coffee, and macadamia dessert. 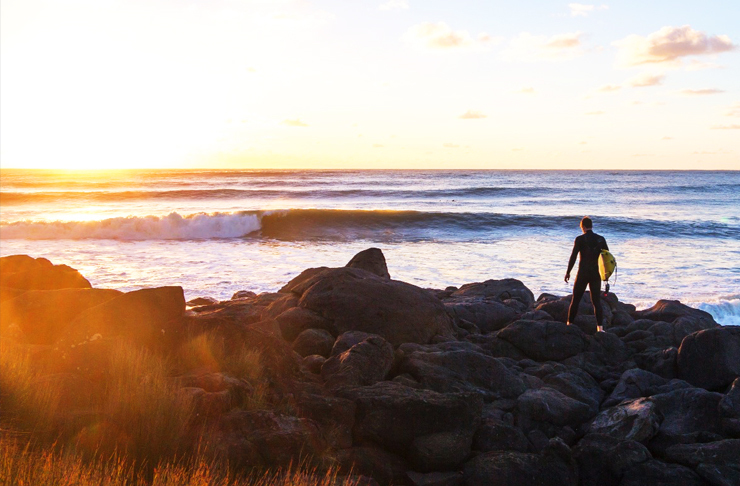 Head south until you hit Raglan. It’s high on the must-do list for surfers, but it’s not all about them, because there’s plenty to do in this little town. First stop is the Te Toto Gorge Lookout. Take it nice and slow as you drive up the narrow gravel path before reaching the car park. From there it’s a short walk up to the viewing platform where you’ll see breathtaking views of the Tasman Sea and a towering cliff drop below. If you’re up for a swim, this may not be the place. Luckily, Ngarunui Beach is just a short drive from the gorge. Another black sand beach on the list, but just as amazing. The waves are perfect to give surfing a go or have a quick dip close to shore. The sunsets are second to none at Ngarunui, with the sun slowly creeping behind the cliffs and turning the Tasman Sea a deep shade of orange. If you’re feeling peckish, swing by the Rock-It Kitchen on Wainui Road for a rustic dining experience. The cafe is set up in an old woodshed, but don’t let that deter yoi—it’s modern makeover is an Instagrammer’s dream. Take your pick of the indoor booths, deck tables, or lawn seats to enjoy your meal. Rock-It Kitchen has a lunch and dinner menu, both packed with organic and seasonal dishes. Try the kumara hash cakes with hollandaise and a poached egg for brunch, or an aged scotch fillet with truggled agria hash for dinner. The menu has plenty of gluten-free and vegetarian options as well as the infamous Raglan Roast Coffee for the strong brew. Make the final stop of the day at Bridal Veil Falls. The 55m high waterfall cascades to look like a bride's veil, and is one of the most scenic spots in Raglan. Take a short walk to the viewing platform above the falls, or venture down the staircase to the (not swimmable) pool at the bottom. Looking for something a little longer? 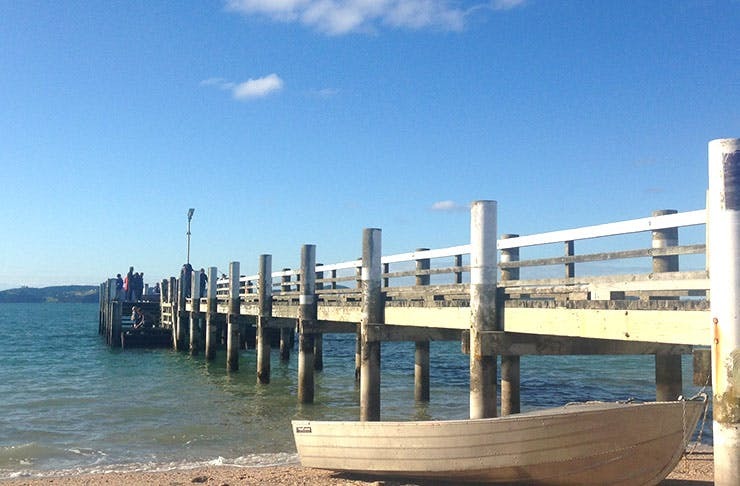 Here are some secret weekend escapes from Auckland.